Create a special memory with a young person (age 10+) or build one on your own — in this class you will build a bent shaft canoe or paddleboard (SUP) paddle. 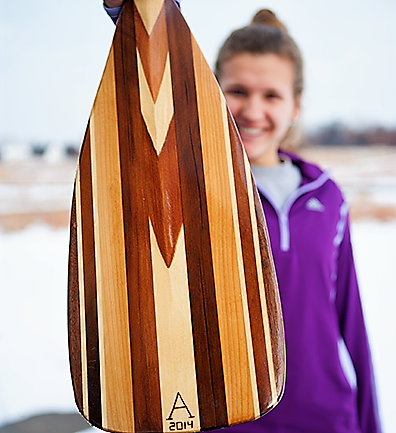 Imagine: finish the paddle and then head out on the St. Croix River, or local lake, to paddle using your own hand-made paddle….what could be better? We can’t think of anything. You will learn about wood selection and grains, use of hand tools and skill saw, paddle design and considerations, and paddle sizing. Each adult or adult/youth team will leave with a completed bent shaft paddle ready for varnishing. This class will take place over 1 weekend in April with 3 different class periods for a total of 7.5 hours: Friday, April 26: 4pm-6pm, Saturday, April 27: 9am-12:30pm, and Sunday, April 28: 11am – 1pm. Adults are invited to register individually, or as part of an adult/youth team. To register with a young partner: register 1 participant using the adult’s information. Be sure to let instructor know in the ‘Comment’ section that a younger partner will also be present, list their name and age. This team will work together to make 1 paddle. 16 and 17-year-old young persons are also welcome to join this class – they must register separately and pay separately, and must be accompanied by an adult also registered for the class. Space is extremely limited! Only 4 paid participants (some combination of 4 adults or adult/youth teams) per class, so register early. This class is one of two classes offered this weekend (both classes are for only 4 total participants).